For my base, I've been reaching for Benefit Porefessional to start things off. It's a mattifying primer and I find that my make up really does stay put throughout the day, if I put this on first. It's pricey but a tube lasts me ages. And it doesn't cling to dry patches which is always good. I then use the Bourjois CC Cream instead of a foundation. I absolutely love this stuff and I'm kicking myself for not finding it sooner. To be fair, it's basically like a foundation because I'd say it gives a medium coverage. In short; it applies really well, gives a good amount of coverage and lasts a decent amount of time without needing a top-up. I'm a bit of a snob when it comes to foundation/base products and usually think high end works best but this stuff has 100% proved me wrong. Bravo Bourjois. The only downside is that even the lightest shade (01 Ivory) is a tad dark on me so, if I didn't have a bit of a tan at the moment, I'd probs be sporting the 'face way darker than neck' look. I've never really been into creamy cheek products before but Bourjois have definitely converted me with their Little Round Pot Cream Blush. I feel like powder blush often fades when it's hot but a creamy counterpart seems to last so much longer. I use shade 03 which is a gorgeous light, dusky pink and it blends in seamlessly when worn with the CC cream. Bourjois are defo becoming my fave 'drugstore' beauty brand at the moment. Y'know how when it's really hot and you're rubbing sweat off your forehead and you end up wiping half your brow off? Yeah, I'm not about that life. But, luckily for me, this Illamasqua Brow Gel has some serious staying power and basically doesn't budge. Yay. 'Awe' is also the perfect ashy shade for us blondies too. I use the Illamasqua Angled Brush to apply and the two paired together are such a dreamy duo. 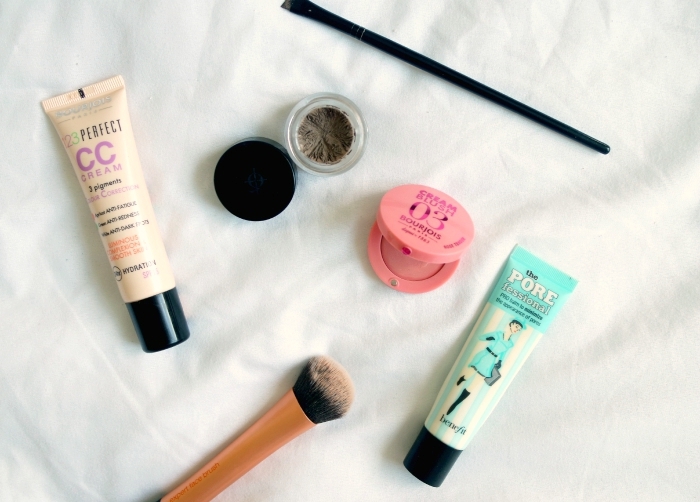 What are your fave sweat-proof make up products?